Rubbish Collection Company in Ilford - The Highest Rating On The Market! 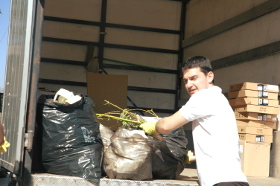 Rubbish collection service in Ilford is provided by Better Cleaning Company. Top-notched cleaning company with huge experience in removal services, as well. We have been on the market for 10 years and we do know how to satisfy and please our customers. As a matter of fact, your constructive feedback is the best value we receive from our reliable rubbish removal services. Accepting this as our practice, we have succeeded to build up the fasted and the most affordable rubbish removal offers across the whole Ilford territory. Note that we are aware of all the dumpsters and recycling centres in Great Britain, so wherever your location is, we will move the garbage to the closest centre without bothering you to look for such. Our hassle-free rubbish collection service is completed by specially prepared, trained specialists. They are all vetted and fully insured. Don`t wait to ask for an advice or discuss the waste disposal in Ilford with the operators until they find the ideal alternative for you. It`s their job. Note that the service is first quoted, because neither the price nor the duration is fixed. The junk removal specialists come to examine the house – loft, garage, apartment, house, basement, commercial IT or Tyre building, warehouse, etc – to see its size and to check the volume and the type of the rubbish. Then, the price is fixed and the date for the junk removal is decided. When you concur, the removal operators are ready to take action ASAP! We provide efficient and affordable garden waste collection Ilford IG, loading & disposal. Our rubbish collectors are skilled to do quick and appropriate green waste removal, brown waste removal as well as waste recycling or dumping. They will certainly pick up any hedge and grass cuttings, leaves, twigs, branches for you and dispose of it in lawful and proper fashion. Rubbish Collection In Ilford IG. Rapid Bookings! Benefit from the many years of experience that Better Cleaning Company had providing rubbish removal Ilford IG services. We are the most reliable rubbish waste carrier in the area. Our experienced two men squads will arrive on time and begin loading instantly if you are satisfied with the price offered. We have inexpensive fees and guarantee fast arrival if you need same day service.Call now and 020 3746 3201 we will also recycle for you, so leave the rubbish collection to us and book our service now!